Banners and decorative ribbons are so gorgeous to me. I just love the look they give to journals, notes, and doodles. They add depth, pizzazz, and emphasis to the page. Lots of people love this look, too, but think that this technique is not within their grasp. Thankfully, it totally is! These cute decorations are simple and fun, and I’ll show you how to draw a banner with three easy techniques you can try right now. This is one of those techniques that can be used with just about any pen or marker your heart desires. I demonstrate below how to do this with Crayola markers, but it can easily be done with a ballpoint pen or even a brush pen! While you’re practicing, you might be more comfortable with a pencil, but seriously, any writing instrument will do the trick. With this tutorial, I figured I could better explain the fine points of the techniques in a video format rather than a written one. So please kick back and enjoy this video tutorial while you learn how to draw a banner! Isn’t that super easy? The beauty of banners is that they look a lot more complicated than they actually are. Basically, you just need to keep the banner the same height throughout the design. After that, it really is quite easy to make it look good. 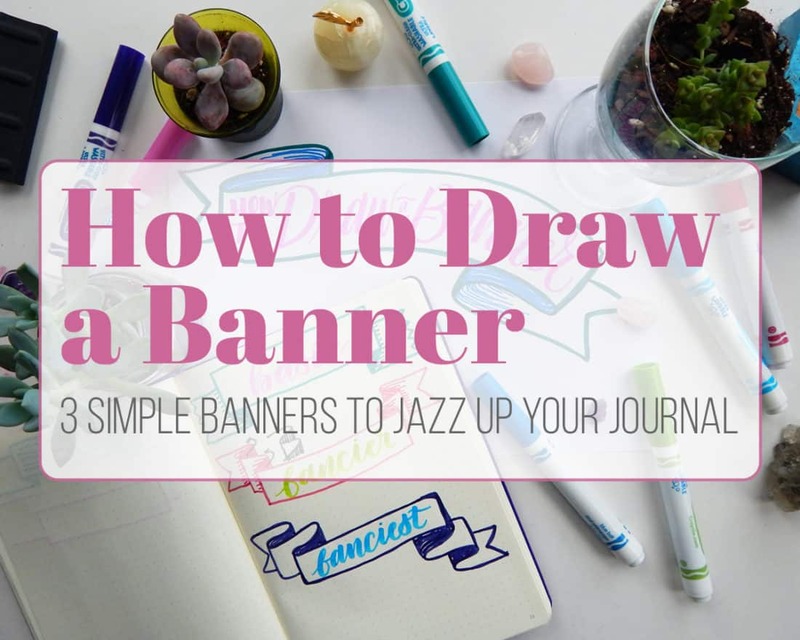 You can write just about anything in your banner to give it tons of emphasis and attention. I like to use mine for headers in my bullet journal, but they’re great for just about anything! Use them for big poster board displays, for extra cute notes, in your planner, or for brush lettering art! The sky’s the limit now that you know how to draw a banner, so go out there and class up the world with your awesome skills! P.S. If you want to learn how to use Crayola for lettering like I did in the video, check it out here! I want to recommend having captions on all videos, since some of your viewers are deaf. Equal access 🙂 Love your website. Thank you for bringing that to my attention Nikki, I appreciate it. Great tutorial – thanks. I have done them from written instructions so this really helped. Thanks, Catherine! I’m really glad this post was helpful to you!